Real Estate Specialist - Hopetoun / Ravensthorpe I began work in June 2000 for South Ag the Wesfarmers Dalgety rural agency as the administrator. In 2004 I studied while I worked as the Administrator of the Landmark branch to achieve my Real Estate Certification and began combining the role selling real estate after hours and on weekends. It evolved into a business that required my full attention and I became their Real Estate Salesperson for our area. Previous to this career I have worked in the Manufacturing/Export Industry, have an Advanced Certificate in Administration with Hospitality Manager plus numerous Business/Computer Software Certificates, I’ve held a Banking role for Challenge Bank & held high-profile community group Treasury roles including the Chamber of Commerce & was heavily involved in the massive task of applying for the licence of the Ravensthorpe Community Child Care business, the initial business set-up and it’s Treasury/Presidency for the start-up period. I’ve done official bookwork for local businesses over the years including the Palace Hotel and Ravensthorpe Cellars businesses plus managed the accounts, staff & marketing for our Landmark agency partnership. Special Achievements Received “Farm Weekly” Outstanding Achievement Award Oct 2004-Sept 2005 Personally settled approx $40m of sales for the area with 25% being rural property. I became an agent in 2007 for the Landmark merchandise store in Ravensthorpe and I worked on expanding our services to cater to the rural community. This was very personally satisfying work and I enjoyed the challenge to double our market share. In 2011 I studied to achieve my Diploma of Property Services, then my Triennial Certificate so I could begin my own agency. Family My three children attend the local School. It is quite a juggle with a young family and the demands of the industry, but I enjoy my career and am passionate about my region, I enjoy being challenged and appreciate that the rewards for hard work are shared with my family. 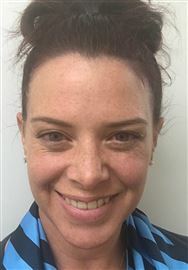 Hobbies Sport especially Hockey and I try to represent the region at Countryweek Hockey in Perth every year and joined an overseas touring group which travelled in 2013 to America: Los Angeles + Barbados to represent the Australian Country hockey touring team. I relax reading novels when the house is quiet, socialising with friends and spending time outdoors with my family. Client Services I have been known to clean toilets, dust & sweep flies and make beds before Buyer inspections…. I believe in going the extra mile and giving attention to detail. I do follow up my sale settlements with a personal touch; a nice gift basket or item purchased at local businesses like a plant for the new home or gift voucher – just little things to say thank you for their support! I throw all I have creatively into each listing to get the best results…my private schooling in Perth gave my good grounding for that and I have to thank my English Literature & Accounting teachers for giving me the skills I now use daily. Through my association with the local Chamber of Commerce & Tourism I use my business role for the promotion of our region to outside Buyers and encourage them to support our local business and services.